Joel D. Valdez Main Library – Jacome Plaza – Downtown Tucson @ 7 am! 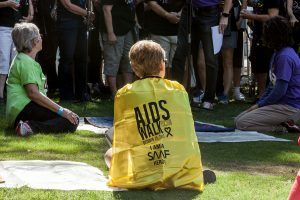 2018 marks 30th years of AIDSWALK Tucson, a fundraiser for the care services, prevention programs, and LGBTQ initiatives of the Southern Arizona AIDS Foundation. We can’t do any of this without the generous support of our walkers, their furry friends, our sponsors, and donors. And of course, the dedication of 300 volunteers who help to make this event possible! REGISTER HERE for this year’s event on Sunday, October 14 and help make a BIG difference in the lives of many. The Fun Run starts at 7:30 am. Runners will do three laps of the course. Walkers start the course at 9 am. If you need to pick up your t-shirt or incentive items or turn in any additional donations, registration will be open starting at 7 am! Any and all pets are welcome! Each registered pet gets an AIDSWALK bandana. Walkers can pick up their swag bags early or turn in any walker money at SAAF (375 South Euclid Ave) on Wednesday, October 10th through October 12th from 8am-6pm! Early Registration will be on the north side of the building. Pick up your shirt at AIDSWALK! Registration opens at 7 am. You can bring your fundraising money to qualify for incentives to Early Registration October 10th – 12th or to registration at AIDSWALK! Make sure you set up your Firstgiving fundraising page and share it with your friends to earn cool fundraising prizes! Level 1: Fundraise $500+ to receive the official AIDSWALK Pennant and the official AIDSWALK T-Shirt to wear during the walk! Level 2: Fundraise $750+ to receive the Level 1 prizes and the official AIDSWALK30 Towel! Level 3: Fundraise $1,000+ to receive the official AIDSWALK pennant, beach towel, t-shirt, and the official AIDSWALK duffle bag! To contact AIDSWALK Tucson, click here.